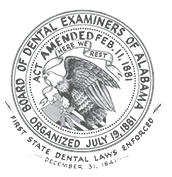 As the dental regulatory agency for the State of Alabama, the Board is responsible for protecting the public by ensuring that dentists and hygienists practice according to the requirements of the Alabama Dental Practice Act. The Board accepts and investigates complaints against dentists and hygienists. The Board does not have jurisdiction over fee disputes, personality conflicts, or rude behavior. If you wish to file a complaint with the Board of Dental Examiners of Alabama, you may download a complaint form above. Complaints must be made in writing on the Complaint Form provided by the Board. All complaints must be notarized. Please answer all questions on the form as thoroughly and as accurately as possible, attaching any relevant documentation. All complaints are to be filed by the person directly affected by the alleged violation(s) unless said person is a minor or a person otherwise unable to file a complaint due to mental or physical impairment; or by another practitioner or health care provider. The Board investigates all complaints thoroughly and as expeditiously as possible. The entire process, however, can take several months, depending on the complexity of the issues involved. Once you file a complaint with the Board of Dental Examiners of Alabama, the dentist or hygienist involved will be asked to respond to the allegations contained within the complaint. Interviews may be conducted by staff investigators. With the information that is gathered, a complaint review team determines if any violations of the Dental Practice Act have occurred. The Board then votes on the disposition of the matter. A hearing may be held and a complainant may be asked to testify as a witness. The Board has the authority, after consideration of the evidence, to discipline the dentist or hygienist. The Board action may be in the form of a fine, reprimand, license suspension, probation, or license revocation. The Board does not have the authority to compel a refund of any fees to the patient because compensation for personal damages is not within the Board's authority. If you have further questions or need more information, please contact Kevin Lane, the Board’s Paralegal, at 205-985-7267 or kevin@dentalboard.org.